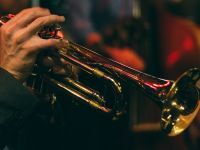 Join us for a captivating experience at our very own Enoteca Restaurant & Lounge, and enjoy elegant live jazz in Paso Robles from some of the Central Coast's top talents. Sip a glass of wine while soaking in the sounds and delighting in Enoteca's signature San Luis Obispo dining. Held every Thursday night from 6:00pm-9:30pm, this is the ideal way to unwind after a long day of exploring California wine country. Don’t forget to make your reservations with our Enoteca host at (805) 238-4911 or at (805) 238-2834. See you soon!